Keeping your pool safe, clean and fun for you and your family will require you to become familiar with the pool chemicals used to maintain water quality. We give you a rundown on the chemicals used in swimming pools and what you need to know about them. Our guide is provided as an introduction to the main pool chemicals, their uses, and advice relating to their safe use. However, you should always read the manufacturer’s instructions on the packaging when using pool chemicals and follow their guidelines to the letter. 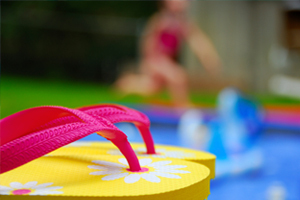 The following are pool chemicals used to kill micro-organisms and bacteria within your pool. The nature of the water in your region will dictate which one is most appropriate; if you are unsure you should consult your local pool company. Chlorine granules – Suitable for soft water areas as they do not reduce pH balance or alkalinity. Mix granules in a bucket of warm water and add directly to pool. Bromine tablets – More efficient than chlorine at high temperatures and less dependent on pH levels, but short lived in direct sunlight. They dissolve slowly and are applied using a suitable dispenser. Maxi tabs and mini tabs – Suitable for hard water areas, these reduce the pH level and alkalinity of the pool. They dissolve slowly and are applied in a suitable dispenser. Shock treatments are pool chemicals used to “super-chlorinate” the pool, or give the water a large dose of chlorine to break up impurities that have built up. They should be used periodically. Calcium hypochlorite granules – Suitable for most swimming pools. Mix into a bucket of warm water and pour directly into pool. Should be used no more than weekly; it’s best to use these late in the evening when you have finished using the pool for the day. You should check your water chemistry levels, such as pH and water hardness daily to make sure they are balanced. If they are outside the correct parameters you will need to use these pool chemicals to adjust them accordingly. For our article on the daily pool service routine click here. pH reducer – Required in hard water areas if chlorine granules are used. pH reducer is added to the pool in order to reduce your pH where it is found to be above 7.6 (alkaline). pH increaser –pH increaser is added to the pool to increase your pH (acidity) level where it is found to be below 7.2 (acid). Alkalinity increaser – Required in soft water areas, alkalinity increaser stabilises the pH when added directly to your pool. It will need to be agitated to dissolve. Water hardener – Required in soft water areas, water hardener increases the calcium hardness level when added directly to the pool water. Algaecides – Algae in your pool will turn the water green. Maintaining the correct chlorine or bromine levels within your pool should prevent algae, but adding a small amount of algaecide periodically can help. Clarifiers – Often particles suspended in your pool water will be small enough to flow through the pool filter, making the water cloudy. Clarifiers coagulate these particles so that they clump together and become big enough to be collected by the filter. Flocculants – Flocculants work in a similar way to clarifiers but tend to cause the collected matter to sink to the bottom of the pool where they will then need to be vacuumed away. Below is a list of the levels in your pool that should be monitored and a guideline to their acceptable levels. Some pool chemicals will require you to take safety precautions such as wearing gloves or goggles. Be sure to always follow the manufacturer’s instructions. For details of where to purchase pool chemicals locally please use the links above to find a local pool company, or click here. Do you have any tips for keeping your pool clean and safe? Leave a comment in the box below.